WILLEMSTAD - After Central Committee meeting of Parliament that was called by the coalition partners, the Prime Minister of Curaçao Eugene Rhuggenaath declared that when implementing a mega-project such as the modernization of the refinery, it is customary to look within one’s own network for the available resources. The Premier says that he is not ashamed to say that his government is now looking at the partners in the Kingdom for help with such a big project. In his speech during the Central Committee meeting, the Prime Minister called on the Members of Parliament to examine the meaning of the word 'resourcefulness'. “What do I win with a fight against the Dutch Kingdom while my goal is to keep the refinery open? My goal is to keep the refinery open and to keep employment. Why shouldn’t I ask the Netherlands for help? Is it because it concerns European Dutch people? In this room we are all Dutch,” said the Prime Minister. The Prime Minister explained that he had deliberately chosen to inform the new government of the Netherlands personally about the situation of the country. In particular about the project of the refinery where Venezuela is indirectly involved and the impact on the island if the negotiations fail. 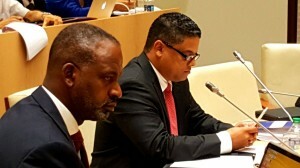 Photo: Prime Minister Rhuggenaath (r) and Minister Martina (l) during the parliamentary meeting.